Booking.com : Hotels in Ban Thaen, Thailand. Book your hotel now! Description Featuring a garden and free WiFi, Greenview Resort is located in Phon. Providing a restaurant, the property also features a terrace. The rooms are equipped with a balcony. Featuring a garden and free WiFi, Greenview Resort is located in Phon. Providing a restaurant, the property also features a terrace. The rooms are equipped with a balcony. Description Nestled within tropical gardens, in Ban Phai, Inpawa features beautiful rooms with hardwood flooring. "The hotel was located in a good location. Near bus station and walking distance to weekend night markets. Facility was extremely quiet and grounds peaceful and relaxing. It is a beautiful place. The buffet..."
Nestled within tropical gardens, in Ban Phai, Inpawa features beautiful rooms with hardwood flooring. 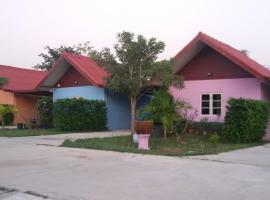 Description Located in Ban Phai, 6 miles from Suntree Land of Dolls Khon Kaen, รักเรารีสอร์ท provides a living room with a flat-screen TV. This apartment also features free WiFi. Located in Ban Phai, 6 miles from Suntree Land of Dolls Khon Kaen, รักเรารีสอร์ท provides a living room with a flat-screen TV. This apartment also features free WiFi.